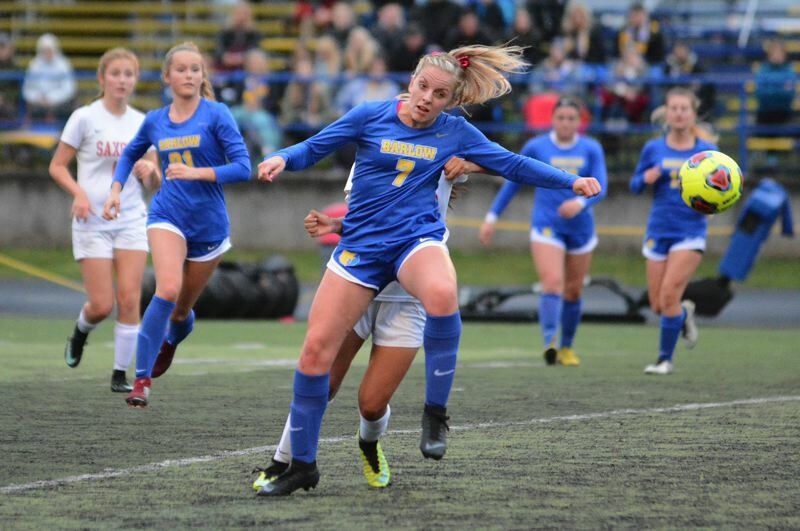 The Barlow girls soccer team started in a flash and went unchallenged in a 5-1 win over South Salem to open the 6A playoffs Saturday night. Shortly after the opening kickoff, Barlow's Rachel Maness was taken down inside the 18-yard box when Saxons' goalie Anna Burger came off her line to challenge the run. No whistle sounded, and the ball deflected out to the top where Barlow's Abi Hoffman took a couple quick touches then slotted a left-footed shot inside the far post. Shortly after the restart from the center dot, Barlow's Mikayla Topaum scored on a breakaway down the center of the field to put the Bruins in charge 2-0 not even five minutes into the match. "Going into the game we talked about the importance coming out with a lot of energy and setting the tone early," Barlow coach Jay Jacobsen said. The No. 7-ranked Bruins host PIL-champion Cleveland in the second round at 6 p.m. Wednesday.